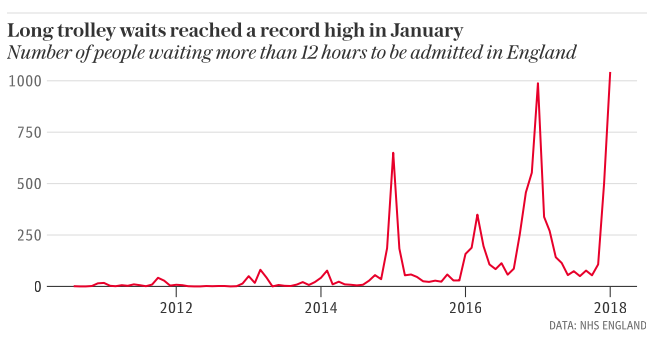 Waiting times are the longest they've ever been – the NHS is facing a real crisis. Waiting times in A&Es around the UK were the longest on record in January, new figures from the NHS this afternoon show. 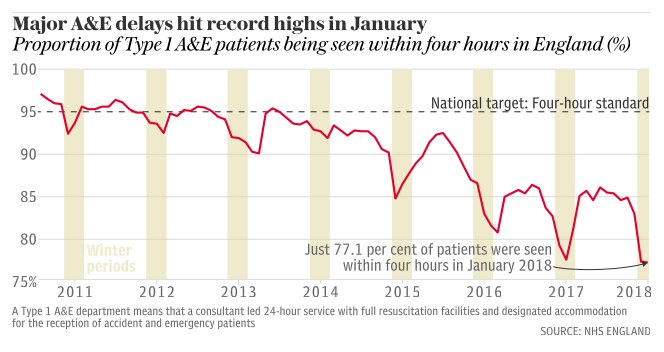 Just 77% of patients in January were seen within four hours of arriving at A&E departments, far below the 95% target and the worst month on record. Over 1,000 patients spent over 12 hours on trolleys – a 6,000% increase compared with figures from seven years ago. Whilst over 80,000 patients spent over 4 hours on trolleys – a 500% increase compared with figures from seven years ago. 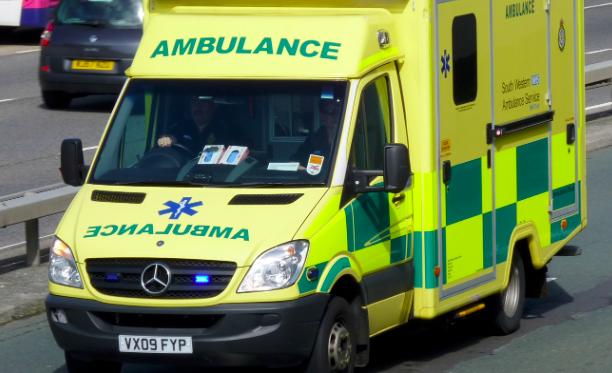 Almost 140,000 patients have had to wait ambulances outside A&E for over 30 minutes, and over 31,000 patients have had to wait longer than one hour. This is the first time on record that waits on trolleys for over 12 hours have exceeded 1,000 and is more than double the figure from December. Over 250 of these patients forced to wait on trolleys were at Royal Stoke University Hospital – a doctor at the hospital last month apologised for “third world” conditions. At the same hospital the daughter of an 80-year-old elderly dementia sufferer said he had been left waiting on a hospital corridor for 36 hours, in “absolutely horrendous” scenes. The winter crisis, that countless medical professionals warned of, now appears to be in full effect across the NHS. And it’s a damning inditement of the Tories who’ve let it build up on their watch. “Today’s statistics expose the hollow nature of the Prime Minister’s claim that her Government has sufficiently prepared for winter. “Almost eight years of severe austerity has left our health service woefully underfunded, understaffed and unprepared for the rise in demand during the coldest period of the year. “Despite the very best efforts of our brilliant NHS staff, patients and their families will understandably be profoundly concerned by the downturn in standards. The appalling human stories arising from the worst winter crisis on record have shocked the nation. All of the warning signs that the NHS was heading towards this crisis were there. The Tories have no excuse for today’s figures. The crisis is we do not have enough people that want to empty bed pans. The NHS is now a social service for junkies, booze bags and lazy glutenous fatsos. It has become a culture.